True North Adventure Cruises, formerly known as North Star Cruises, is a privately owned Australian company based in Broome, Western Australia. It's owned by entrepreneur Craig Howson, who started the company more than 25 years ago and is regarded as a pioneer of luxury adventure cruising along the stunning and remote Kimberley coast of northwestern Australia. He's very much a hands-on owner who's often onboard keeping tabs on his ship and mingling with cruisers. As such, the business largely operates on repeat customers and referrals from past passengers. True North has built several ships during its history, but it began operations with small charter vessels with a capacity of 10 passengers or less. While the company has expanded its itineraries to include West Papua and Papua New Guinea, South Australia including Kangaroo Island, the Rowley Shoals coral atoll off the coast of Broome, and Sydney at Christmas and New Year's, the Kimberley wilderness remains a signature destination. The season runs from the end of March to early September and is always busy. One of True North's most popular Kimberley itineraries is a seven-day cruise from Broome to Wyndham or the reverse, a voyage that fuses the key natural sights of the region with some off-the-beaten-track destinations. As True North operates in some remote locales, True North provides transfers for cruisers to and from the ship, and when in West Papua and Papua New Guinea, transfers include international air. True North is also an enthusiastic supporter of philanthropy, particularly in West Papua and Papua New Guinea. Each year, True North transports donations of clothing, school supplies and sporting equipment to remote communities, and the company sponsors a village school. Passengers also pitch in from time to time. The company is sensitive about their environmental footprint, and the line aims to minimise any disruption to the places and people it visits. Part of the True North Cruises philosophy is that its trips inspire a greater appreciation of natural history and underline the importance of the wilderness -- and the maintenance of it. Every cruise offers detailed information on the areas the ship is exploring, relating to culture and natural history. All activities are lead by staff who are trained to encourage minimal impact on the environment. True North's owners, True North Adventure Cruises, believes that cruisers with an eye for adventure shouldn't have to compromise on luxury; this 36-passenger ship is no exception. True North Cruises is an Australian-owned and -operated cruise line, offering a luxury expedition cruise experience on a single ship, True North. If you enjoy a small-ship experience with fewer passengers, high-end cuisine and an enthusiastic crew which doesn't stand on ceremony, this is an expedition cruise to consider -- if you can afford it. Venturing into remote locales, True North is a ship with a focus on luxury accommodations, coupled with a plethora of daily activities and expedition-style outdoors experiences. It's a cruise of dawn starts, daily safety briefings and plenty of clambering on and off small boats. Activities are strongly geared toward the environment in which the ship is exploring, which could include game fishing, snorkeling, diving and sightseeing on land or hiking, glass-bottom boat excursions, off-ship picnics, wildlife spotting, helicopter flights and educational lectures. On a Kimberley cruise, for example, you may be cruising along the coastline on an excursion boat photographing saltwater crocs or enjoying a bird's-eye view of the landscape from the onboard helicopter. True North is petite in size, only carrying 36 people, but it has most of things you expect when forking out for a luxury expedition ship experience, including a dining room with a view, high-quality cuisine and spacious accommodations. It's a "casual attire" kind of environment, however, with a no-footwear policy onboard. The onboard currency is the Australian dollar. No tipping is required, but if you wish to reward a crewmember for going above and beyond the call of duty, you can. About 90 percent of passengers hail from Australia, with some from New Zealand and the rest from overseas -- particularly the U.S. and Europe. It's a grownup adventure experience ideally suited to baby boomers and retirees, ages 55 to 75, with deep pockets. But you will find younger cruisers onboard from time to time. Although disabled passengers may have difficulties, the cruise suits all levels of physical ability, with a few opt-in strenuous activities thrown in for good measure. Single cruisers are also welcome. True North has no specific facilities for children or child fares, and no special consideration is given to kids older than 12; as this cruise comes with a hefty price tag, it would be rare to see any junior cruisers onboard. True North Cruises operates a single ship, True North, which has carried close to 10,000 people since it launched in 2005. Although there have been rumors of a second ship joining the fleet at some point in the future, to date none has materialized. 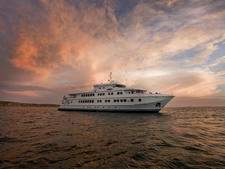 True North is a boutique ship, purpose built for adventure cruising. Because of the vessel's size, itineraries exclude lengthy periods at sea so cruises involve daily ports of call and frequent excursions; you'll be kept on your toes. Facilities onboard include solid expedition boats for excursions (rather than Zodiacs) and snorkel and diving equipment. Most cruises have the benefit of an onboard helicopter for aerial sightseeing. At 164 feet (50 metres) long, True North is just large enough to offer all the comforts and mod cons befitting a luxury expedition vessel, but her shallow draft of just more than 7 feet (2.2 metres) means the she can also negotiate shallow and difficult-to-access environments. The Kimberley is a prime example, where tides can vary as much as 39 feet (12 metres).